The U.S. Geological Survey (USGS) periodically publishes streamflow statistics, such as flood-frequency, flow-duration, and mean annual streamflow statistics, for gaged sites with long-term record. Regionalized regression methods recently have been developed for estimating many of these streamflow statistics at ungaged sites as a function of measured physical and climatic drainage basin characteristics. The USGS Streamflow Statistics (StreamStats) Program was developed, in cooperation with ESRI, to make estimation of basin characteristics and streamflow statistics at ungaged sites easier, faster, and more consistent for the average user than previously employed manual techniques. Manual measurement of drainage basin characteristics is inconsistent, prone to error, and can take hours or days for large basins. Geographic Information System (GIS) techniques can produce drainage basin characteristics in seconds with greater accuracy and reproducibility. retrieve information for USGS data-collection stations. 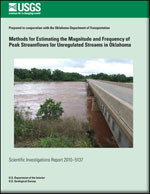 With the cooperation of the Oklahoma Department of Transportation, the implementation of StreamStats for Oklahoma is now available at http://water.usgs.gov/osw/streamstats/oklahoma.html. 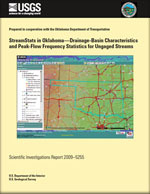 The foundation of the Oklahoma StreamStats application is a raster-based topographic model that integrates three publicly available national datasets – the USGS National Elevation Dataset (NED), the Natural Resources Conservation Service Watershed Boundary Dataset (WBD), and the USGS National Hydrography Dataset (NHD) – into a hydrologically correct, 1:24,000-scale topographic representation of the Oklahoma landscape which is displayed on a series of topographic base maps. The Oklahoma StreamStats application covers most areas within the state of Oklahoma. Basin characteristics available for computation include contributing drainage area, contributing drainage area minus area regulated by floodwater retarding structures, mean annual precipitation at the basin outlet, and main-channel 10-85 stream slope. Streamflow statistics now available for computation include the peak flow at 2-, 5-, 10-, 25-, 50-, 100-, and 500-year recurrence intervals for rural, unregulated streams or rural streams that are regulated by NRCS FWR structures. 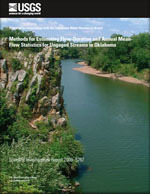 Oklahoma StreamStats also provides estimates of monthly, seasonal, and annual flow-duration statistics and annual mean flow statistics for sites on ungaged streams in cooperation with the Oklahoma Water Resources Board. 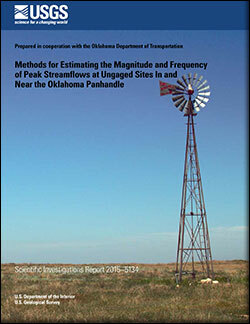 Methods for estimating the magnitude and frequency of peak streamflows for unregulated streams in Oklahoma; 2010; SIR; 2010-5137; Lewis, Jason M.
Smith, S. Jerrod; Esralew, Rachel A.
StreamStats in Oklahoma - Drainage-Basin Characteristics and Peak-Flow Frequency Statistics for Ungaged Streams; 2010; SIR; 2009-5255; Smith, S. Jerrod; Esralew, Rachel A.